I once heard a Christian apologist state that “true science is observable, repeatable, testable, and measurable.” This has the ring of common sense. In other words, in the words of Henry Morris in Evolution and the Modern Christian, “science…means knowledge—not theories, opinions, beliefs, or philosophies, but actual, verified, factual, certain knowledge” (p. 41.) Evolution says this fish ought to have evolved into something else by now or died out. But look at the picture. It exists in an animate condition just as it did before. This is observable, measurable, and testable. And since more than one coelacanth has been landed of late, the whole scientific process is repeatable. True Science then, not just the Bible, is at odds with Evolution. Evolutionists mock Christians for believing that dinosaurs lived in recent times when the ceolacanth that was just caught was like discovering a living dinosaur! “It was like discovering a dinosaur,” the journalist wrote. 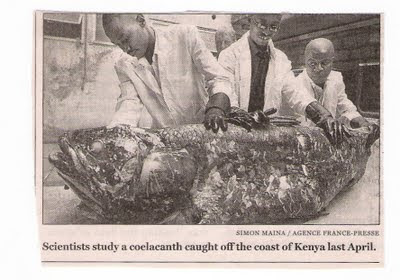 Biologist Tony Ribbink wants ‘to know if the enigma can be explained.’ About spotting the coelacanth in its oceanic habitat, diver Pieter Venter said, “It was so weird, like from another world…like seeing a UFO.” Will these men come to a competent judgment about the existence of this UFO-like enigma? It depends how much their opinions are, or remain, prejudiced in favor of a Theory that is disputed by their scientific findings. A Theory that excludes God cannot be relied on to unravel a mystery if the answer lies concealed in the word of this God the Theory denies the existence of! “It is the glory of God to conceal a thing: but the honour of kings to search out a matter” (Proverbs 25.2.) Enigmas are searched out to their proper end by the permission and blessing of God. Evolution is what the Bible calls “science falsely so called” (1 Timothy 6.20.) Christians come under a lot of pressure, especially in universities, to accept without question, the theory of evolution. And some professors will ‘err concerning the [Christian] faith’ (verse 21.) Any Theory that is embarrassed by the appearance of a creature the Theory asserts to have gone extinct millions of years ago should be questioned at least as much as this one questions the existence of God. Christian faith demands loyalty even at the cost of a failing grade or a loss of tenure. There may be loss for believing biblically, but there need not be any shame for it because current findings may be brought forward to show that science itself is biblical.